An unpopulated virtual environment, to introduce students to the landscape and environment of Middle Passage ships, a Caribbean port, plantations and pens. English planters first began growing sugarcane in Barbados in the 1640s, using a mixture of convicts and prisoners from the British Isles and enslaved people from Africa. Sugar agriculture was very profitable and it quickly spread throughout the Caribbean and to Louisiana and Mississippi in North America. Hundreds of thousands of enslaved men, women and children were brought from Africa to the Caribbean and America so that Europeans could have sugar and rum, the main products of sugar cane. Sugarcane was an unusual crop. Europeans were used to growing crops such as wheat, which they then harvested and sent to other people who would turn the crop into flour. But on Caribbean and American plantations enslaved labourers had to do everything. They sowed, tended and harvested the crop, and then worked to extract the juice from the sugar cane and boil and process the juice in order to turn it into sugar and molasses, and later they might work to distil some of the waste products into rum. The sugar plantation was both a farm and a factory, and enslaved men, women and children worked long days all year round. There are picture from this period, showing sugar agriculture and production. But we must remember that the artist who created these pictures wanted to make the system look good: they were defending slavery, trying to show people back in Britain that it wasn’t too bad. Therefore we cannot take these pictures at face value, and must always remember how terribly hard this work was. Young men and women joined the First Gang in their late teens, once they were strong enough, but within ten or twelve years the hard work had wrecked their bodies and they were relegated to the Second Gang, which worked hard but not as hard as the First Gang. After perhaps twenty years in the Second Gang, a person now about 40 years old would appear old and worn out, and would join other old people and young children in the Third Gang (the ‘Grass Gang’), which weeded the crops, and gathered weeds and grass as feed for animals. White owners and overseers watched over all of these processes, and enslaved ‘drivers’ also organised work. Overseers and drivers had whips, and they used them to force enslaved people to work harder. In the early summer the First and Second Gangs prepared the fields for planting, turning over the soil with hoes. Then in the late-summer and early-autumn the First Gang would plant the sugar cane, often using the cane-holing process. 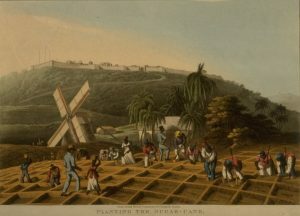 William Clark, ‘Planting Sugar Cane,’ Ten Views in the Island of Antigua… (London, 1823). Courtesy of the John Carter Brown Library at Brown University. Cane-holing was back-breaking work. First Gang slaves marked out squares of between 4 and 6 feet square, then dug out each square to a depth of 6 to 9 inches. They used only hoes, not spades, making this work even harder. A First Gang slave was expected to dig out between 60 and 100 squares each day, which involved moving as much as 1,500 cubic feet of soil. The soil taken out was built up as a bank around each square. Two young sugar cane plants were then planted in each hole, and First and Second Gang slaves then carried huge baskets of animal manure on their heads to the squares, placing sufficient manure around each plant. This was both hard and disgusting work, and was hated by the slaves. One large basket of dung, containing as much as 80 pounds of manure, was sufficient for two holes (four sugar cane plants). One acre of sugar cane plants might require as much as 1.25 tonnes of manure. In the Caribbean weeds grow quickly, and if left alone they will quickly strange and destroy other plants and crops. Throughout the year the older people and children in the Third Gang constantly weeded sugar cane fields, and they also set traps and hunted the thousands of rats who enjoyed feeding on young sugar cane plants. Some white masters gave rewards to the enslaved people who caught and killed the most rats. Sugar cane plants were often much taller than a man when it came time to harvest them in February or March. The men and women of the First and Second Gangs used ‘bills’ (billhooks), very sharp curved knives. Men and women of the First Gang had to constantly bend over and hack through the thick sugar cane about six inches from the ground. They then used the bills to cut the top and the leaves off the cane. Second Gang slaves would tie the canes into bundles and load them onto wagons. 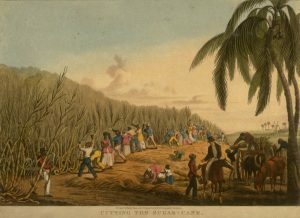 William Clark, ‘Sugar Cane Harvest,’ Ten Views in the Island of Antigua… (London, 1823). Courtesy of the John Carter Brown Library at Brown University. Once harvested the canes had to be processed quickly, for if left for too long the juice inside the cane would spoil and become useless. As a result during harvesting and boiling season (February to April) the slaves of the First and Second Gangs worked harder than ever. 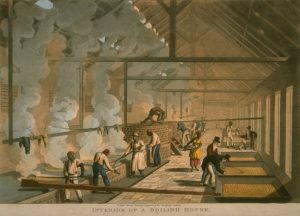 On large plantations the sugar mill and boiling house worked round the clock, 24 hours a day six days a week. The First and Second Gang slaves were divided into two groups, with the first group working 12 hours during the day, and the second group then working 12 hours during the night, after which they repeated the cycle. The canes were taken to the mill (which might be powered by wind, by animals or by people. The wind drove large rollers, and enslaved men fed the canes back and forth between the rollers which crushed them and allowed the juice to run into collecting pans, and from there along pipes to the nearby boiling house. This was dangerous work, for these men were often exhausted, and sometimes they did not let go of the sugar cane in time and their arms were drawn into the rollers: when this happened an axe was used to chop off the crushed arm: some plantations had one-armed men who had suffered this fate. The juice ran down into a large holding tank in the Boiling House. From there it ran into the largest copper vat or bowl, and fires below this bowl boiled the sugar juice. Skilled men and women stirred it as it boiled, and skimmed off the top. The Boiler, a highly skilled slave, decided when the juice had been sufficiently reduced and purified, and he then allowed it to be ladled into the next, slightly smaller copper vat, where this process began again. This happened four or five times, and with each transfer the cane juice became darker and thicker. William Clark, ‘Interior of a [Sugar] Boiling House,’ Ten Views in the Island of Antigua… (London, 1823). Courtesy of the John Carter Brown Library at Brown University. By the end of the process one gallon of the original cane juice might produce about one pound of muscovado (semi-refined brown) sugar. When the cane juice was in the final vat the Boiler decided when it was about to crystalize, at which point he tempered it with lime juice, and transferred it to an unheated cooling vat. Once properly cooled it was transferred to clay pots, and then several days later holes in the bottom of these pots were removed and molasses drained out of them. The molasses were taken to the spirit or still house, and distilled into rum. What was left in the pots was semi-refined sugar, which was dried in the sun, packaged up, and sent to Europe and America. The white men who owned plantations knew that this tremendously hard work would so exhaust many enslaved people that they would die young. Each year a planter bought newly imported slaves from Africa to replace those who had died. One Barbados planter named Edward Littleton estimated that a sugar planter who owned 100 slaves and employed them in growing and processing sugar cane would kill them all in 19 years. The production of sugar required – and killed – hundreds of thousands of enslaved Africans. So, between 1748 and 1788 over 1,200 ships brought over 335,000 enslaved Africans to Jamaica, Britain’s largest sugar-producing colony. Yet in 1788 a Jamaican census recorded that only 226,432 enslaved men, women and children were alive on the island. Even with all who had already been there before 1748, the more than 335,000 new arrivals, and all of the children born to enslaved mothers, many died to produce sugar. 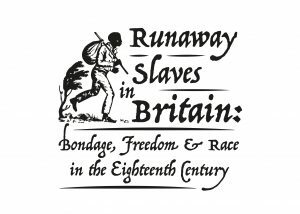 The St Lauretia project is an off-shoot of the Leverhulme Trust funded project “Runaway Slaves in 18th century Britain”, run by the University of Glasgow. Click here to be directed to the Runaway Slaves in 18th century Britain website. Follow our Twitter by clicking here.